This one was recorded a while back and I've been sitting on it for various reasons, hence dated references to E3 and LA Noire, but now it can finally wing its wicked way into your ear sockets. In this, the second podcast officially termed Show & Tell, Gabriel and I discuss the merits of sandbox gameplay, pulp literature and heavy drinking, while arguing over how the format's supposed to work. I've also invested a little in the hosting provider in order to allow unlimited downloads, so feel free to go nuts. This project is now officially operating at a loss. 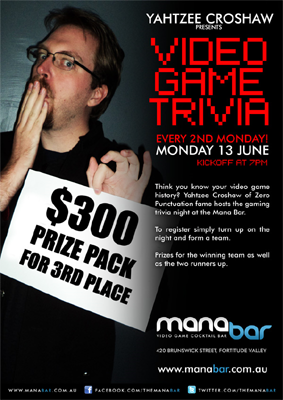 Also, trivia night on Monday (the 27th) at the Mana Bar as usual. Less gimmicks this time! Attention, regular attendees of Yahtzee's Trivia Night (and non-attendees looking for the excuse to give it a go). We're doing something a little bit weird for this Monday's (the 13th) quiz. As implied by the image below, we're putting a bit of effort into making a really good prize pack, and we're going to give it away to whoever comes third. First and second will still get prize packs, of course, they just won't be as, you know, good. Why are we doing this? For larks, mainly. Partly it's because I've been keen to experiment with the format lately, partly because while first and second place have a couple of stubborn recurring placements, third place tends to be more of an X-factor. Last time, an all new team won it. Perhaps that will be you, this time? Oh yes, and just to make this even more of an X-factor, I'm not going to reveal the scores of any teams until the end. You'll only know how well you're doing, and how well whatever the team next to you is doing. That should keep things interesting, shouldn't it. So come along to the Mana Bar on Monday, June the 13th any time before 7, be you regular or shy experimenting quiz pupae, and bring a team. Or just one other person, but you'd both better be pretty confident with each other's know how. Perhaps a victory could be just what you need to win over your quiz partner into full on mouth kissing, if that's what you've been hanging around them for. Boy, you would have loved the podcast Gabriel and I vocalised yesterday. I say 'vocalised' rather than 'recorded' because after an hour we noticed that we forgot to get the actual recording device in on the action. Shame. It was a good one. You'd have loved it.